Donald Trump has cancelled his visit to London to open Kieran Timberlake's new £750 million US embassy, and criticised the "bad deal" that saw its predecessor sold for "peanuts". The US president was expected to attend a ribbon cutting at the new embassy building, which completed last month, but the visit has now been cancelled, with no new date offered. Tweeting this morning, Trump attacked the Obama Administration for selling off the former US embassy – a building in Mayfair designed by celebrated architect Eero Saarinen – in favour of the new "off location" site in the less-central Nine Elms district. He described Saarinen's 1960 building, which is being converted into a hotel by David Chipperfield, as "the best located and finest embassy in London". The new site for the US embassy on the banks of the River Thames in west London, was acquired back in 2008 during George W Bush's presidency. The building broke ground in 2013. The full £750 million needed to finance the completion of the new embassy was raised through the sell-off other US government properties in London. Details of the completed building were revealed in December 2017, with an official opening expected to take place next month. Trump has attacked the Obama Administration for selling off the former US embassy, which he described as "the best located and finest embassy in London"
While Trump claims he cancelled his plans to officially open the embassy in February over the relocation and sale of the former site, many speculate the real reason was the risk of protest over his visit. Reacting to the news today, London mayor Sadiq Khan tweeted that the president was "not welcome" in the UK. "His visit next month would without doubt have been met by mass peaceful protests," said Khan in a statement. 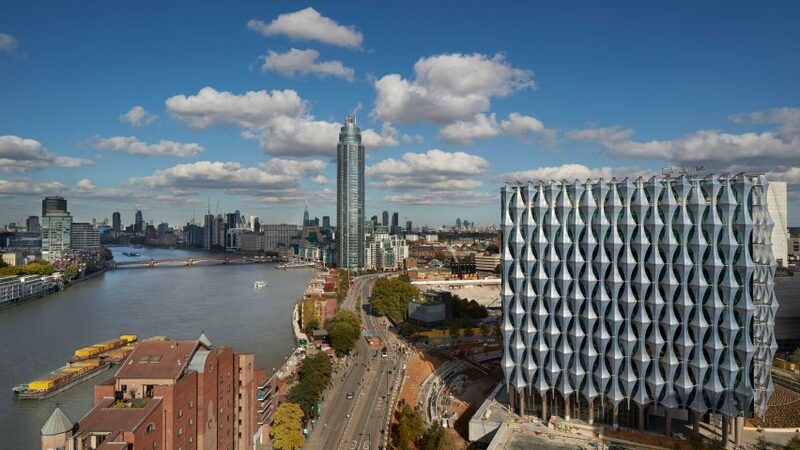 In December, the US Ambassador to Britain, Woody Johnson, said he believed Trump would visit London, but when Dezeen spoke to the US embassy last week officials said there were no plans for a ribbon-cutting ceremony. Speaking on the BBC Radio 4's Today show, US-born UK-based commentator Charlie Wolf said: "As the leader of the free world and your closest ally, we've had nothing but controversy [over] his coming as a friend and an ally and its been relegated down to a ribbon cutting." "If it was me I would say I'm not flying thousands of miles just to cut a ribbon, I have more important things to do. I don't think it's wounded pride, I think its a slight on the United States itself," he continued. "I think he's probably gotten tired, as I know many over here have, of the constant debates, the constant debating in parliament. To me it has always seemed a bit silly. The executive, which is Number Ten, is probably the one that deals with foreign affairs, they've made an invitation, and suddenly we're seeing debates in Parliament, which is essentially the legislature." Prior to the show, Wolf also took to Twitter to criticise the expectation that the US president should travel to London for the opening of the US embassy. SERIOUSLY, you're the most powerful man in the world and they expect you to travel all the way to LONDON just to do a ribbon cutting ceremony -- and be given a load of grief by the locals for your efforts. I wouldn't either. The new building by Philadelphia-based practice Kieran Timberlake is understood to have more stringent security systems than Saarinen's original design – one of the reasons for the move – while aiming to achieve a feeling of "transparency, openness, and equality". One security feature is a moat-like pond that surrounds the base of the cubic building, which is covered on two sides by sails of ethylene tetrafluoroethylene (ETFE) plastic and raised above landscaping by a plinth. Photograph of the new US embassy is by Richard Bryant.